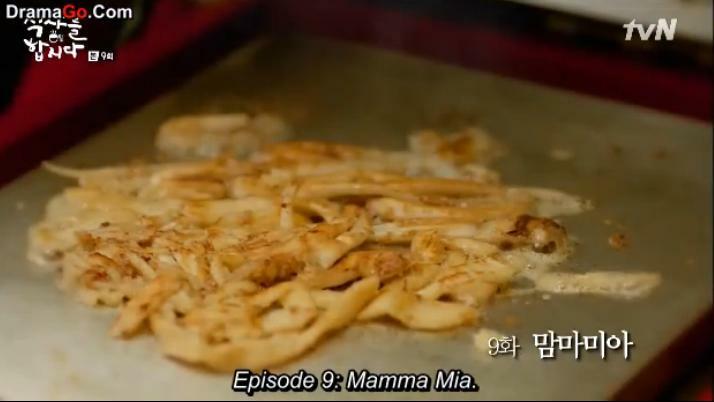 So I finally got around to recapping episode nine of ‘Let’s Eat’! YAAAYYYYY. How awesome! I apologize for taking so long. I was busy with school and my teacher were assigning us students 1,000 homework assignments every night, I didn’t have time for anything else. But yesterday I wanted to get episode nine recapped so that I could start on episode 10 tonight hopefully. 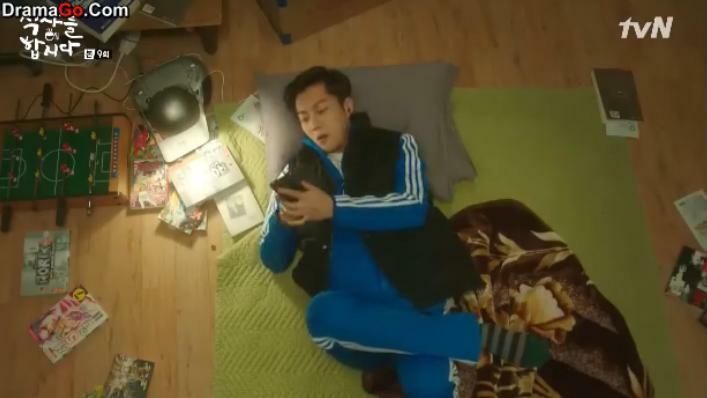 The episode begins with Soo Kyung browsing on her laptop while her mom is busy snoring dreaming away in her apartment. 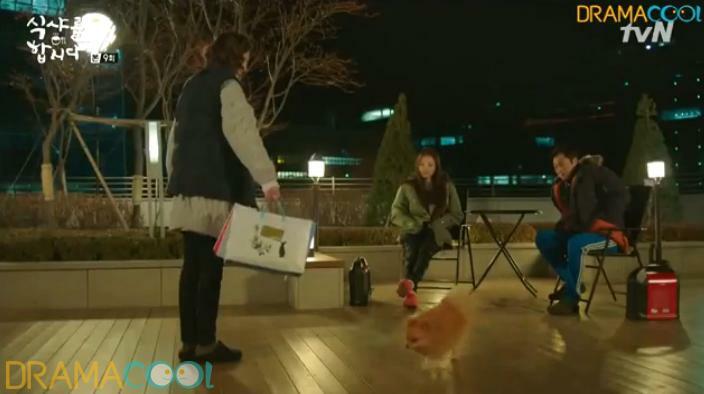 Soo Kyung wishes to see Barassi (who if you recall isn’t with her at the moment because her mom is allergic to dogs) so Soo Kyung reunites with her two awesome neighors Jin Yi and Dae Young who are busy taking care of Barassi. When Soo Kyung reunites with Barassi with her arms wide open, Barassi just ignores her and goes back to playing with Dae Young and Jin Yi. But she eventually gets him to come back to her by bribing Barassi with a treat. Aw, too cute. Soo Kyung hands Jin Yi a bag with side dishes that her mom made. 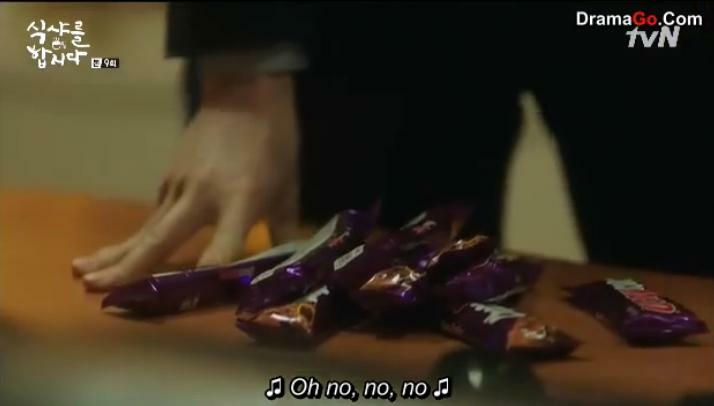 Dae Young witnesses this happen right in front of him and starts pondering over where his bag of side dishes are to which Soo Kyung hands him his bag to stop his complaining. Together they return to their apartments to avoid the cold weather. Inside Soo Kyung’s apartment, she awakens her mom from her little nap so they have a talk afterwards. Soo Kyung’s mom expresses her dislike for Jin Yi since Jin Yi’s always calling her grandma (lolol). Her mom brings up the topic about marriage again and pressures Soo Kyung to get married as soon as possible which only results in an argument between the daughter and her mom. Dae Young can hear all the yelling in Soo Kyung’s apartment so to rest his ears, he puts on head phones to catch a break. Haha, too funny. Episode nine’s episode is titled ‘Mamma Mia.’ the movie? Soo Kyung wakes up to the sound of a game being played by her mom. It’s early in the morning but her mom is too busy playing a game on her cell phone to even consider this wonderful idea of sleeping. She laments over how she’s taking care of her single daughter but gets over it quickly by telling Soo Kyung to hurry up and get ready for work. Soo Kyung lies to her mom that she’s taking a monthly paid leave when really she had quit. At the attorney office, Lawyer Kim, Lawyer Oh, and Gyu-sik are looking over all the resumes and job applications that came in to replace Soo Kyung. Gyu-sik realizes how lucky he is to have been born earlier since if he was to apply for a job in the attorney office, he wouldn’t have been able to since the competition with the other job seekers seems pretty tough. Lawyer Oh adds on to Gyu-sik’s thoughts saying that what he said was true because if he had applied, his qualifications would have been the lowest on the list. Ommgggg, so mean. Lol. Gyu-sik tries to convince Lawyer Kim to have a company dinner that night but he rejects the suggestion because he has a blind-date to go to. Back at Soo Kyung’s apartment, she’s busy checking up on Lawyer Kim’s blog while her mom just finished cleaning her dirty and messy bathroom. She checks Soo Kyung’s closet and finds a jacket in there that Soo Kyung wants her mom to take off because she’s afraid her mom is going to rip it. That’s when Soo Kyung agrees that she’ll go buy her mom some new clothes so she won’t always get tired of wearing her old ones. So together they head out to go shopping! (yay for some mother-daughter bonding time!). Right when Soo Kyung and her mom is outside of her apartment, Dae Young is seen walking back to his. He greets Soo Kyung’s mom and gifts her with a piece of gum as a sign of gratitude for the dish he made her. Soo Kyung’s mom grows curious as to what her relationship with Dae Young is but Soo Kyung just brushes it off, claiming that they’re just neighbors. Jin Yi gets to spend some time alone with Barassi since she’s in charge of taking care of him until Soo Kyung’s mother leaves. She plans to make Barassi some clothes so she shows him the different kinds of fabric that she got and tries to get his approval. Barassi disapproves all the fabric that Jin Yi presented and decides to go get the one he wants himself so he goes and gets a red clothing that also happens to be Jin Yi’s favorite. But she’s willing to sacrifice the red shirt just to satisfy Barassi, which causes him to express his happiness by spinning around in circles. SO FREAKING CUTE. Soo Kyung and her mom are at the mall shopping for clothes when her mom finds a jacket that she really likes. However, the price is a bit too expensive so she tries to get the sales person to lower the price for her a bit and even goes as far as to compare the jacket with another similar one she saw at another department store. Embarassed, Soo Kyung tries to buy the jacket for her mom but her mom doesn’t want her daughter to be wasting so much money on the jacket so they walk away empty-handed. At the attorney office, Dae Young comes to visit again like how he usually does. Lawyer Oh called him to come because she needed to give him something. She pretends to act like she and Dae Young are close to each other as evident when she wraps her arm around his. 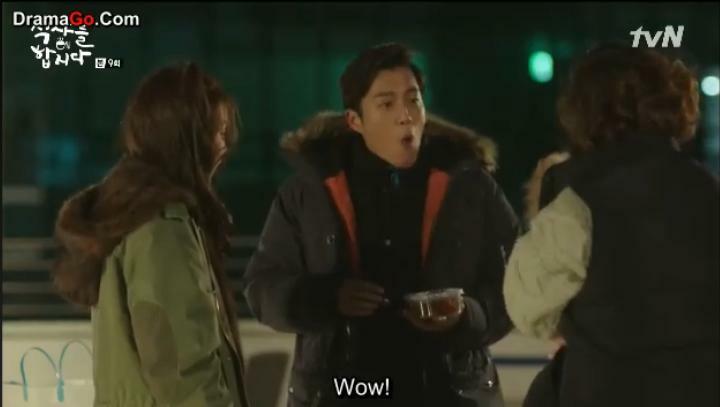 (LOL at Dae Young’s reaction!). It doesn’t come as a surprise that the reason as to why Lawyer Oh called Dae Young in to see him was so that she could give him her uncle’s insurance contract. She adds that her uncle approves of Dae Young and would even like him to be the son-in-law of the Oh family. It’s not long before she grabs his hand and expresses her thoughts on wanting to be his. While she’s doing this, Dae Young freaks out and tries his best to avoid her gaze (as well as hold in his anger. Haha). Lawyer Kim invites Gyu-sik to have lunch with him and asks him to pick the menu. 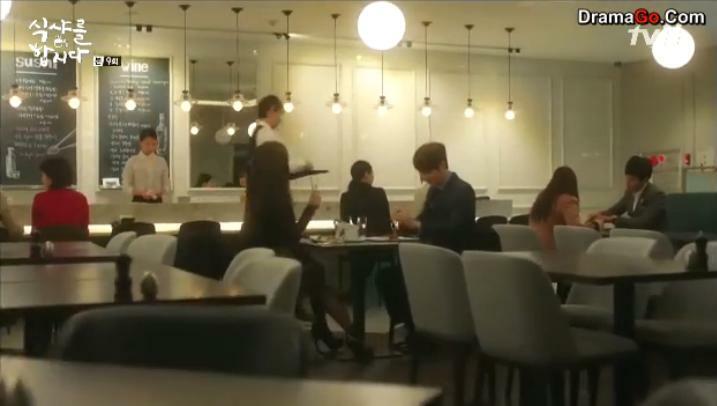 But every dish that he suggests is not favorited by Lawyer Kim, which causes Gyu-sik to realize just how much have changed since Soo Kyung left (since she was always the one who chose what to eat for lunch and dinner). Soo Kyung and her mother are at the theaters after leaving the department store. Soo Kyung can’t help but stare and drool at all the hotdogs, nachos, and popcorn that are being made so she orders some for her and her mother also. Her mother once again brings up the issue about marriage and compares Soo Kyung to a woman not far from where they’re sitting who is seen playing with her child. This results in yet another argument that makes Soo Kyung’s mom overwhelmed and annoyed so she walks away. Lawyer Kim and Gyu-sik are returning from lunch when they meet Dae Young outside of the attorney office building. He tells Lawyer Kim that he had heard about Soo Kyung’s resignation and talks about how she coped with the loss afterwards. It seems like Lawyer Kim still has bad feelings and thoughts about Dae Young from that one time he saw Dae Young drop Soo Kyung off at her work place so he asks Dae Young, “You two seem close. Are you guys dating?” Dae Young of course denies it and goes on about his business, answering calls from his clients (who are usually women). Soo Kyung is hanging around in the library by herself after her mom left her angry and infuriated. While walking around the library, she comes across this book titled “Don’t Give Up, You Only Live Once.” That’s when she asks a worker there where the civil service examination books are only to find the location of the books filled with high school students. So Soo Kyung changes her mind and picks up a call she receives from Kyung Mi. Meanwhile, Soo Kyung’s mom is walking around on the street when she enters the dry cleaning shop that Dae Young visits frequently. She asks the owner if he knows any sauna that opens for 24 hours is but since he doesn’t know, he calls Dae Young to help him. Dae Young notices that it’s Soo Kyung’s mom which then causes him to assume that she must have left the house. He invites her to live with him since it’s cold but she denies his offer because she doesn’t want to feel indebted to him. Dae Young is eventually able to persuade Soo Kyung’s Mom to live with him for the time being. When they get to Dae Young’s apartment, he tries to clean and organize his apartment by kicking all the cans and mess on the floor away. Dae Young does his best to make her comfortable but she can’t be comfortable because his apartment is just way too messy. So together they clean Dae Young’s apartment up so that Soo Kyung’s mom can feel comfortable in the end. Soo Kyung’s Mom asks Dae Young if he would like to play the card game ‘Go-Stop’ with her to which he agrees to. Soo Kyung has gone to Kyung Mi’s apartment to have some time with her best friend. They talk about Soo Kyung’s current situation and what she plans to do now that she’s unemployed. Soo Kyung suggests some ideas like learning to cook since she loves food but Kyung Mi, being the honest person that she is, ridicules Soo Kyung for even thinking of the idea (what a great best friend right?). J That’s when Soo Kyung asks if she should try working in an insurance company but Kyung Mi quickly brings Soo Kyung back to reality and implies that it might not be the best job. (I’m surprised Soo Kyung even thought about that). Back at Dae Young’s apartment, he and Soo Kyung’s Mom are continuing their game of ‘Go-Stop’ to which to Soo Kyung’s Mom’s surprise, Dae Young is actually very good at the game. Instead of betting money like how they have been doing, Soo Kyung’s Mom asks Dae Young if she can bet something else other than money…uh-oh, you’re thinking what I’m thinking right?…? Lawyer Kim is on his blind date with a woman that Dae Young knows since he meets up with her from time to time as her insurance planner. Because the woman knows Dae Young, Lawyer Kim asks her questions about his private life to her to which she doesn’t know the answers to since she doesn’t really know him that well. But he keeps on asking her questions about him which makes the whole blind date that much awkward. Soo Kyung returns to her apartment to find her mother no where to be found. Just when she’s about to exit her apartment to search for her mother, her mom comes entering the apartment with Dae Young following her closely behind. Soo Kyung’s Mom wants to cook a meal or dish so Dae Young volunteers to help out. 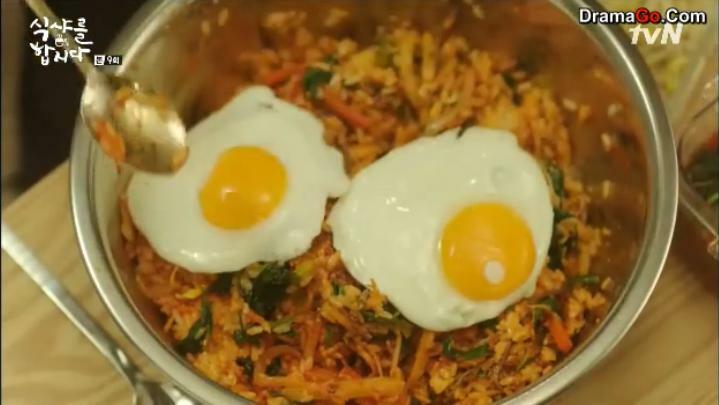 He ends up frying eggs since Soo Kyung herself doesn’t know how to do that much (LOL). Lawyer Kim still can’t stop asking questions about Dae Young to his blind date. This makes his blind date irritated and mad and she even goes as far as to question whether he likes men or not. Lawyer Kim replies that he think he’s finally realized how he feels so his blind date walks away in shock and disgust because she thinks he likes men. But in the next scene, we see Lawyer Kim’s struggle and the reason as to why he asked so many questions about Dae Young. It’s not because he likes men or Dae Young that he repeatedly asked about Dae Young; it’s because he misses Soo Kyung and is curious about her that he couldn’t stop. He returns to the attorney office and walks to what was once Soo Kyung’s desk, throwing on there a bunch of the bars that Soo Kyung always hid in her desk drawer saying, “If I do this, will you come back?” (Ohh, right in the heart!). Lawyer Kim cries over Soo Kyung and wants her to come back. Soo Kyung helps her mom find the location of the wedding that she’s planning to attend while they wait outside for a taxi. When Soo Kyung’s mom finally gets inside of a taxi, she gets a phone call from the marriage consulting firm asking about Soo Kyung’s membership application forms to which Soo Kyung’s Mom states that she’s decided to not send them in anymore (so wait, did she win the ‘Go-Stop’ game against Dae Young?). Soo Kyung treats Jin Yi and Dae Young out for some food because she wanted to express her gratitude towards them for taking care of Barassi, but Dae Young think it’s because her mom isn’t home anymore so Soo Kyung’s just very lonely (which is true btw). Jin Yi’s business is successful so far as she receives a call from one of her customers so she steps out to go talk, leaving Dae Young and Soo Kyung behind by themselves. Dae Young demands Soo Kyung to go get him some water but Soo Kyung, being the stubborn person she is, questions him why she should. That’s when he replies, “Because Noona, you’re mine.” HOLD UP. OMG. NO. IT CAN’T BE HAPPENING. THIS ISN’T HAPPENING. THIS ISN’T WHAT I’M THINKING RIGHT. We return to the scene when Mom asks if she can bet something else other than money in which we find out she placed a bet on Soo Kyung! HAHAHA. So Dae Young won the game so now he owns Soo Kyung. Too hilarious. Soo Kyung is in total denial and thinks Dae Young’s lying but he’s not. We see the ‘Don’t Ask’ assault incident criminal standing outside of Soo Kyung and Jin Yi’s apartment, eyeing the door as if he’s deciding which women to attack first. Ooh, sccarrryyyy. This episode wasn’t too fascinating and interesting. More laid-back and repetitive this time around with Mom always constantly bringing up her wishes and want for Soo Kyung to get married. I mean I understand Mom and her desperation to find Soo Kyung a man because Soo Kyung is getting old and living alone as a divorcee (and unemployed) is not always the best living condition. However, in the past two episodes, this issue is constantly brought up and it gets aggravating and tiring…just because we’ve seen the same argument and scene about the marriage about how many times now? I was excited when Soo Kyung and her mom were going to go out and bond, but every time Mom always talked about marriage, Soo Kyung always tried to avoid it which only lead them into an argument which then caused them to get mad at each other and eventually the cycle began all over again. I might be over thinking this but I’m wondering if Mom asked to play the ‘Go-Stop’ game with Dae Young on purpose. Yes, I know I know it sounds crazy and stupid, but I mean we obviously have seen how desperate Mom wants Soo Kyung to get married, so if playing ‘Go-Stop’ with a potential husband is going to get Soo Kyung started on her journey towards a marriage, why not do it?! I do love Soo Kyung’s mom and I hope we see more of her in the future episodes because she’s hilarious. I was kind of happy the drama didn’t really focus on the ‘Don’t Ask’ assault incidents these last few episodes. It was rewarding that way because there was nothing dark, mysterious, or random floating around the drama that have such entertaining, funny, and bright characters. But it seems as if the mystery will continue in the next episode judging on the preview and the epilogue which isn’t always the greatest thing because it takes away from the bright and cheerful drama, but I’m willing to put up with it anyways because we don’t have a choice do we?